Southern California doesn’t get much rain in May. On any given day in the middle of May the chance of measurable rain in Los Angeles is around 4 in 100. Overnight we’d beat those odds, and this morning the weather looked more like March than May. 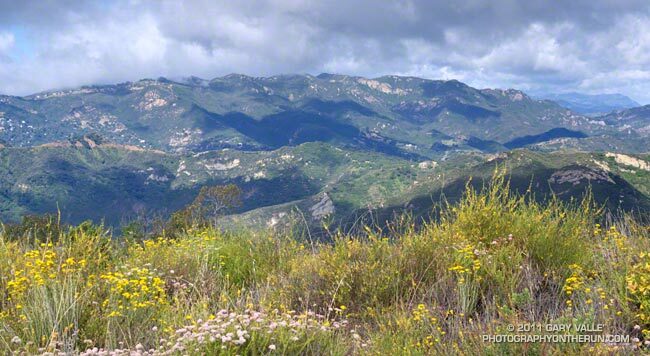 The view above, across Topanga Canyon to Saddle Peak, is from a popular viewpoint off the Temescal Ridge Trail (Fire Road #30), about 4 miles into the Trailer Canyon – Trippet Ranch Loop. This 17 mile route is one of several excellent trail runs that start at Marvin Braude Mulholland Gateway Park in the San Fernando Valley. It crosses the Santa Monica Mountains on the Temescal Ridge and Trailer Canyon fire roads, dropping down to Pacific Palisades, and then returns by way of Santa Ynez Canyon, Trippet Ranch, and the Musch & Garapito Trails. Here’s an interactive Google Earth browser view of a GPS trace of my route.